Nothing goes better with Southern BBQ than a pint of beer and a glass of whiskey. Come in and appreciate some North Carolina Style BBQ, house-brewed beer, well-crafted cocktails, and more than 120 whiskeys. Southpaw will be closed on the following dates. Who says all the fun happens on the weekend. Let us help you get through the less eventful days with some delightful ways to stay entertained. Nothing goes better with BBQ than beer and whiskey. Come join us for $1 baby back ribs and buckets of Miller High Life ($15 for 6) on Sunday and Monday nights. We'll be serving them up all night long until we run out! It's Hump Day and what better way to usher in the race to the weekend than with $4 Well Drinks all night long. We'll make it through Hump Day together, one drink at a time. We've got some pretty delicious house beers and as a thank you to all of our loyal patrons, we offer them for $4 all night long on Thursdays. It's our Locals Happy Hour. 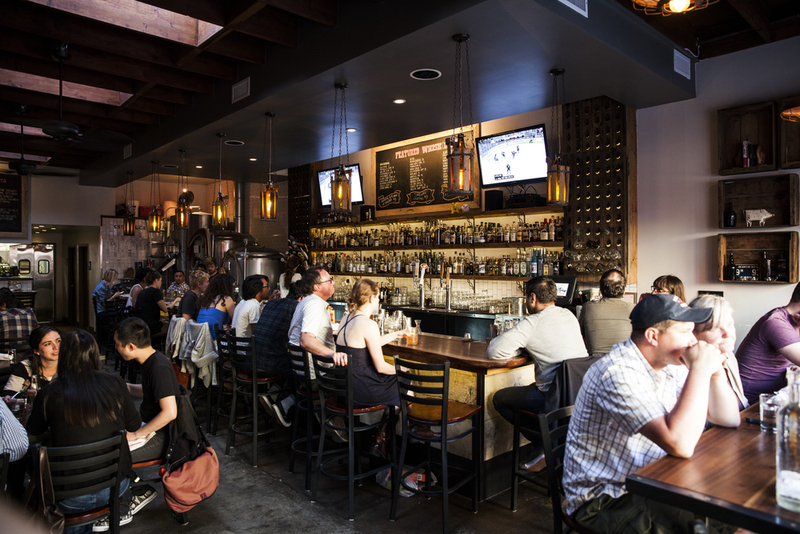 Southpaw is a casual brewpub that accepts limited reservations for our dining room. We reserve a portion of our dining room as well as our 20-seat bar for walk-ins. Walk-ins are seated on a first come first served basis and parties must be complete to be seated. For larger parties of 8 or more, we do a family-style menu. We hold a credit card on file and only charge the card if the party does not show for the reservation. Reservations can me made online through our website, through Yelp reservations, or by calling the restaurant at 415-934-9300. We are constantly stretching our boundaries with the diversity of beers we brew, but great quality and good company is something that never changes at Southpaw. Come sip and enjoy some of our latest brews. Southpaw has a 7 Barrel brewing system, which allows us to create unique batches of beer with each brew. We rarely brew the same beer twice and enjoy collaborating with our fellow brewers in the Bay area on creative recipes. We also offer unique rotating house sour beers and barrel-aged beer. We strive to maintain a friendly and approachable atmosphere, while providing exceptional, balanced cocktails. We produce a great deal of our ingredients in-house and use high-quality local spirits whenever possible. With over 100 whiskeys at the bar and growing, Southpaw offers a strong working-class whiskey program. We offer 3 rotating whiskey flights that highlight and allow customers to compare different styles, distilleries and geographic areas. *Named one of the Best Whiskey Bars in SF by Thrillist. Southpaw rewards customers who try through 40 of our whiskies with a bottle of the one they enjoyed the most. Come in and order either a flight or glass of whiskey to get started.